You don't have to be a vegetarian or vegan to enjoy the food. The DFW has a number of delicious dining options for you. Can you find veggie-friendly options if you live in Cowtown? I'll help you find some here. I'm certainly not a vegetarian/vegan but I do enjoy the food. As the daughter of a Texas rancher, I'm stepping out to sample all the great foods DFW has to offer. And then some. Many in DFW live and love the vegetarian/vegan lifestyle. Trust me, there's more to it than just ordering some bean and cheese nachos or a salad. While most restaurants offer vegetarian/vegan options, here is a list of full-fledged veggie-only restaurants and helpful ​resources. Step out from your carnivorous box and try something new (and healthy) today! I was blown away by how flavorful the veggie tacos were at Cosmic Cafe in Dallas when I sampled them. I would totally order them again. Soon. Vegan: Restaurant is completely vegan. (Excludes meat, eggs, dairy products and all other animal-derived ingredients). Vegetarian: Restaurant is completely vegetarian, with a good number of vegan-friendly options. Vegan-Friendly: Non-vegetarian, but offers meals specifically targeted to vegans. Vegetarian-Friendly: Non-vegetarian, but offers some vegetarian meals also suitable for vegans. Type of Restaurant: 100% raw and vegan. Their tradition is lactovegetarian but they are committed to serving the vegan community and clearly indicate the items on the menu that contain dairy products. Kalachandjis, 5430 Gurley Avenue, Dallas, TX 75223. It's the place where you can eat veggie tacos (I have and they are delicious! ), practice yoga, meditate, bang a gong, and explore many expressive, meditative and celebratory dance concepts. How zen is that? 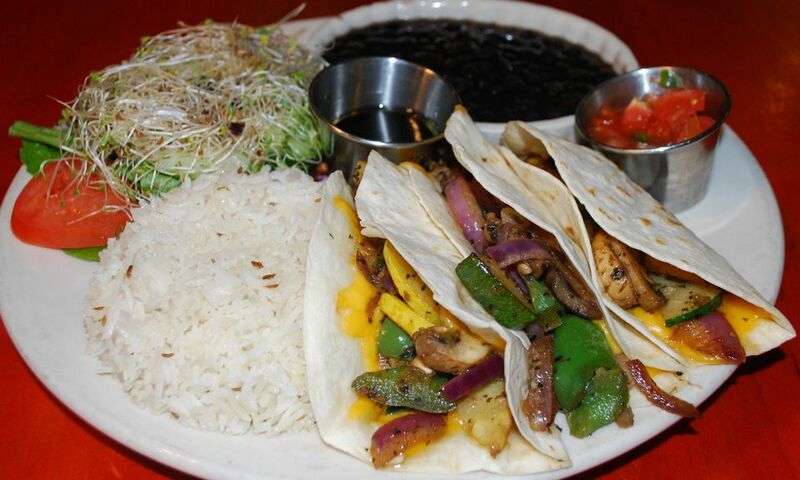 As a matter of fact, Cosmic Cafe's veggie tacos were named as some of the Best Tacos in DFW is in 2010. Type of Restaurant: Vegan, organic food. Type of restaurant: Vegan, authentic vegan cuisine from Vietnam. Type of Restaurant: A gourmet food truck that's 100% vegetarian and gluten-free, and about 90-95% vegan (changes daily depending on some food items). The menu you see online is only a sample menu and it changes daily. It's a sustainable truck that uses items that are compostable and recyclable. The plates, forks and spoons are made from plant starch and napkins are made from recycled content. Most popular food items include the gluten-free pizza, BBQ tacos and Karma Asada Tacos (the play on carne asada is made from GMO organic soy protein). How cool is that? The Good Karma Kitchen also made an appearance at the 2012 State Fair of Texas. Check out Asian-inspired fare as well as Tex-Mex and more. Fred Huang-Davis once operated a mobile vegan food truck in the Fort Worth-Dallas area. He has parked the truck and is now offering catering and private chef services. DFW Whole Foods Market can help you shop for your special diet whether it's vegetarian or vegan. They offer many healthy options. Create an account online so you can sign in and dine in. Whole Foods Market, who supports organic and sustainable farms, is located in Arlington, Dallas, Fairview, Highland Park, Plano ad Richardson. Vegan 101 is Dallas-Fort Worth's premier vegan meet-up group. We host a variety of fun, laid back events and provide support and friendship to anyone interested in a cruelty-free lifestyle. All levels of veg welcome - vegan, vegetarian, even the veg-curious. This group started as the vegetarian connection for Fort Worth back in 1992. Max and Grace Girouard actually started the group by putting an article in the Fort Worth Star Telegram looking for vegetarians in the area. Steve and Cindy Hader were some of the first to join in the fun. Cindy said that Vegetarian and Vegan lifestyles have changed and grown and so has the group. It's very informal. Check out the website for recipes, information on dining out, how to meet another vegetarian in your area, potlucks and more. Receive emails with helpful info including events, restaurants and more. Type of restaurant: All vegan buffet. Seasons 52 is one healthy option because they serve a lot of vegetarian-friendly dishes like salads, organic edamame, hummus, and flatbreads. Here's more on Seasons 52.